Ask fellow campers about "Santa Fe Trail COE" and nearby attractions. Spacious park on edge of beautiful lake. Stayed here while traveling through. 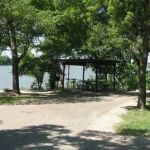 Santa Fe is just one of 3 or more RV parks around Council Grove lake at the edge of the beautiful Kansas Flint Hills. The park was almost deserted due to being middle of week and after prime lake boating season. Asphalt pad with huge parking areas and convenient to rest rooms, showers etc. Beautiful view of lake from our site. Would definitely stay here again. We camped at Santa Fe Trail COE in a Motorhome. This was our first experience in a "COE" park, and we decided to give it a try due to the great reviews others had posted. We couldn't believe the price - with our National Parks Pass - just $11. Incredible. It was gorgeous, right on the water; it was quiet, crickets being about the only noise, and, due to being out from town with few lights, the nighttime stars were spectacular. Wide, level sites with large, grass borders and an incredible setting. We DEFINITELY will plan to stay at other COE sites. A network of amazing sites across the country. Give 'em a shot. We camped at Santa Fe Trail COE in a Motorhome. Beautiful park with my site on one of the coves. Very wide and very level concrete pad with a covered picnic table and grill. Water and electric at the site also. There were only 9 sites on this cove with a grassy area in the middle so the sites were spacious and not right on top of each other. The attendant at the gate was very pleasant, she even ventured over to check on a camper next to me who had scraped his arm. I would definitely stay here again. We camped at Santa Fe Trail COE in a Motorhome. Be sure to see the Tallgrass Prairie and Konza Prairie to experience what Kansas was like. Gorgeous landscapes in the Flint Hills. Another great Corp of Engineers camping area. There are three campgrounds surrounding a man-made lake. 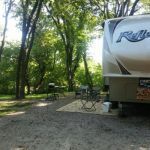 Santa Fe Trail campground had more than one camping loop. Very nice sites with picnic table, BBQ, covered patio. Asphalt roads and asphalt pads. Most pads seemed slightly sloped but mostly even. Power at 20, 30, 50. Widely scattered trees but some shade at each site. Plenty of open spaces in May. Shower house near the group campground was mostly clean and usable. Due to heavy rains and high water in the reservoir, several sites were closed and the dump station was closed, but we were able to use the dump station at a campground on the other side of the lake. Awkward if you're dumping every day, but we were there only two nights and had no difficulty using the dump station on the way out. We camped at Santa Fe Trail COE in a Motorhome. Tallgrass Prairie National Preserve is nearby and worth visiting for the tallgrass and the well-built ranch complex from the early 1900s. Scenic road to and from. Sites 6-9 are first come first serve with power. There a lot of great sites in this park. We camped at Santa Fe Trail COE in a Fifth Wheel. Sites 1 & 2 in this section are full hook-up but gravel surface. 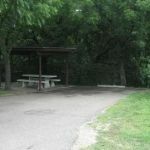 Not all sites are concrete but all sites do have covered picnic shelters with new BBQ grill and concrete tables and benches. All sites are extra wide and deep so there is plenty of room for additional vehicles. Restrooms in lower Santa Fe Trail are clean and have clean showers, upper section is a pit toilet. Roads are paved. Camp hosts are okay. Be aware of COE regulations on the use of their facilities, especially the ones NOT published on their website. This is a quiet, pleasant campground with access to the lake. We enjoyed our stay in this campground and would return. We camped at Santa Fe Trail COE in a Fifth Wheel. One grocery in Council Grove, two fuel stations with diesel. The drive to historic sites is worth the effort. Tallgrass Prairie National Preserve (get lucky might see the Bison herd) and Eisenhower Museum, Library, Chapel and Childhood home are worth the time and effort. Council Grove is a key site on the Santa Fe Trail. Great campground. Beautiful lake. Asphalt roads and paved campsites. Situated for easy back in. Long sites, covered picnic tables. New covered grills. Small marina with boat slips. No beach but beach available elsewhere around lake. Small playground. Lots of shade and very clean. Quiet, and campsites are spacious. View of lake from every site, most sites lakeside. Town of Council Grove is about 1.5 miles away and a delightful little historic town. Most sites level. Few are not. Many reservable. We loved this campground. Will go again for sure. We camped at Santa Fe Trail COE in a Fifth Wheel. This is a very clean campground through the Army Corps of Engineers. There are only two sewer hookups (sites 1 and 2). It was very peaceful and on the outskirts of town. The on-site managers were fantastic. The sites are spacious and level with lots of trees. We also liked that it was gated. We had no dislikes about this park. We would stay there again. We camped at Santa Fe Trail COE in a Travel Trailer. Are you affiliated with Santa Fe Trail COE ?